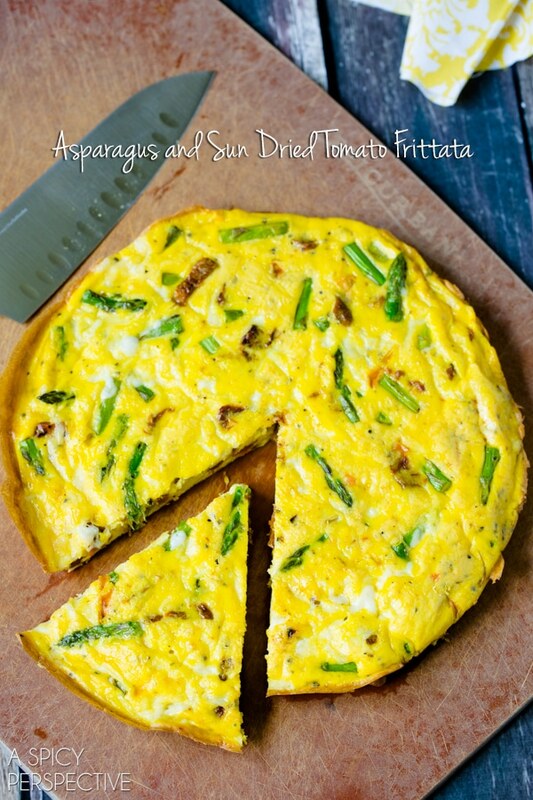 This amazing frittata recipe loaded with fontina cheese, asparagus, and tangy sun dried tomatoes is a brilliant main dish to serve for breakfast or brunch… or lunch, or dinner, or a mid-afternoon snack. Actually, it’s pretty wonderful anytime you serve it. 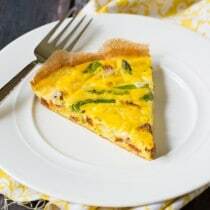 Rounding out week one of Estate d’Italia (Summer of Italy) on ASP, were serving up a rustic Italian frittata recipe that is both simple and elegant. A good classic frittata recipe is a wonderful platform for your favorite italian cheese and all your garden-ripe summer veggies. Frittatas are Italy’s answer to Quiche and Omelets. A crustless egg pie, focused on allowing the fillings to shine through. 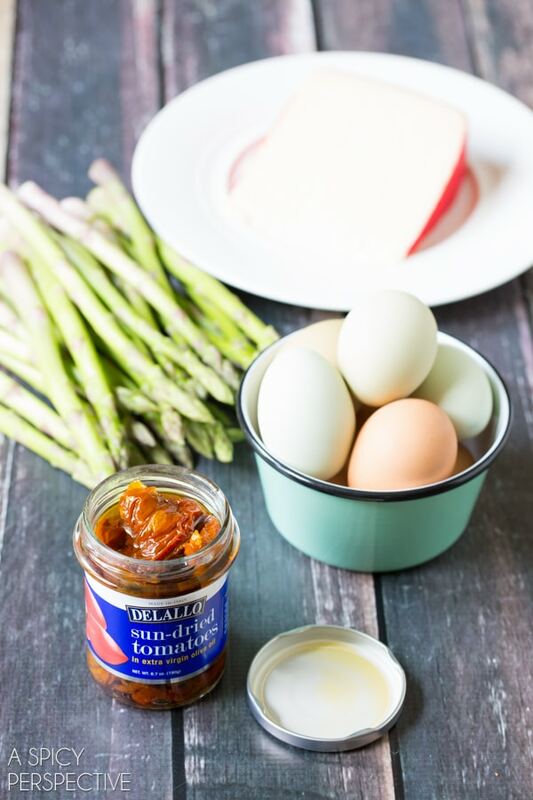 This combination of seared asparagus and tangy sun dried tomatoes is a fabulous complement to the richness of the eggs and the creamy melty fontina cheese. You can make this frittata recipe in a regular skillet with a lot of oil to keep the eggs from sticking. However, if you use a good non-stick skillet it should slide right out of the pan, without having to use any extra fat at all. 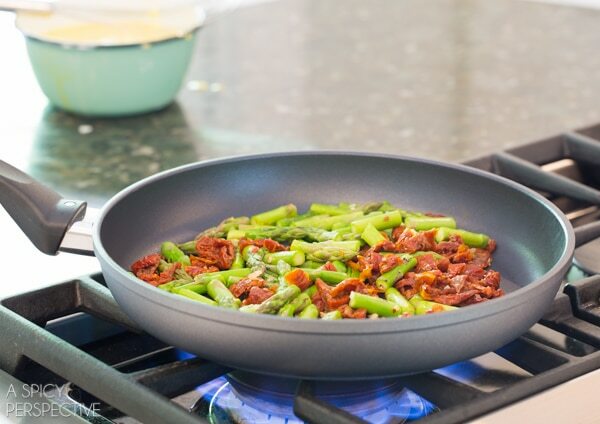 Start by searing the garlic, asparagus and sun dried tomatoes in a dry non-stick skillet. Then swirl the pan vigorously while pouring in the egg mixture… like this. Add the fontina, and pop the skillet in the oven for a few minutes to finish cooking. Then slide the frittata out of the pan and cut into wedges. 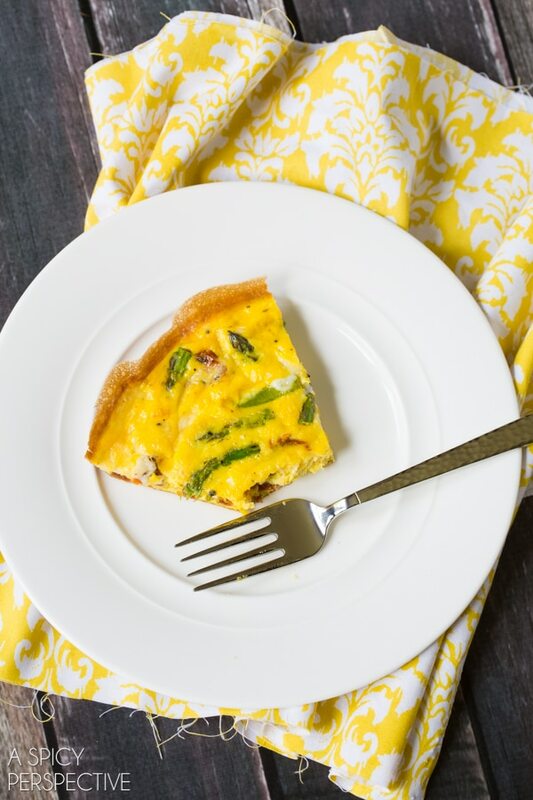 This asparagus and sun dried tomato frittata recipe is best served with a simple green salad (with a tart vinaigrette) and some fresh summer fruit. 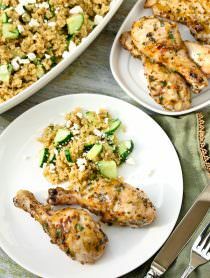 It’s a warm fragrant protein-packed meal that we all look forward to devouring, whether we’re at home or abroad. Make sure to follow along on our Instagram feed to see what we’re up to in Italy this week. Preheat the oven to 350 degrees F. Crack the eggs into a medium bowl. Add the cream, 1/2 teaspoon salt and 1/4 teaspoon pepper, then whisk thoroughly. Cut the bottoms 2-3 inches off the ends of the asparagus and discard. Cut the remaining asparagus into 1 inch sections. Place a large non-stick skillet over medium heat. Sear the garlic and asparagus for 2-3 minutes. Then add the sun dried tomato pieces and sear another 2 minutes. 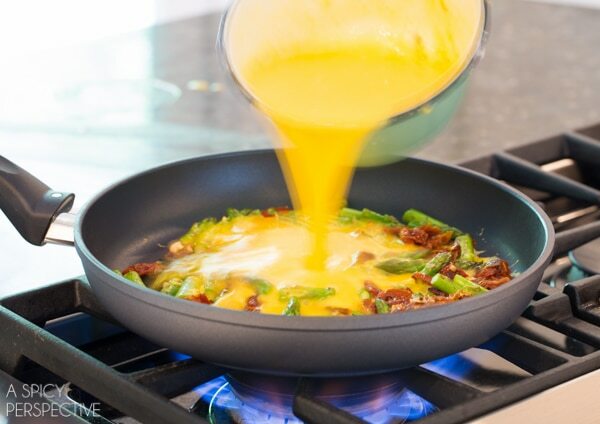 Briskly swirl the skillet around as you pour the egg mixture in—this creates a crust on the outer edge. Then add the shredded cheese. 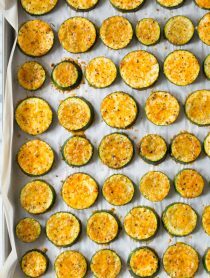 Remove from the stovetop and place in the oven for 10- 15 minutes until cooked through. Slide the frittata out of pan onto a cutting board and cut into wedges. Yum! 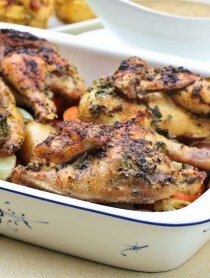 I’m going to try that this week for supper! That is one lovely dish. I love anything with sun-dried tomatoes, so this is perfect. I made this for our dinner last night. The kids didn’t care for it–one doesn’t like asparagus, while the other liked the flavor of the dish, but her stomach can’t tolerate eggs cooked in this form for some reason. The husband suggested that a slice of bacon cooked crispy and crumbled into this would be just the little thing that would take it from good to “wow!” I think he’s right. This tasted mild, but good. Although I did use homemade sundried tomatoes when I made mine. That could have been part of the mild flavor. 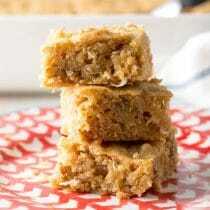 I’m keeping the recipe and making it again, but not for the kids next time. Love frittatas with sun-dried tomatoes! This is wonderful! This is absolutely beautiful, Sommer, and it sounds delicious! Totally gorgeous! 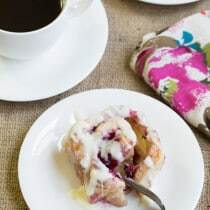 I need to add this to my brunch menu this weekend! Yep – I could pretty much eat this any time of day! 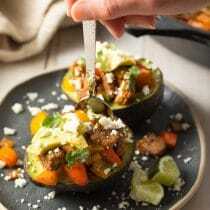 Love everything about this recipe! This screams summer! Loving these flavors! Frittata for dinner is something I like to during the hot long summer days. 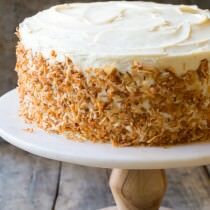 Must make this! A couple of my favorite frittata ingredients here. I’d just add some mushrooms and be set for life! Hope you’re having a fabulous time in Italy! 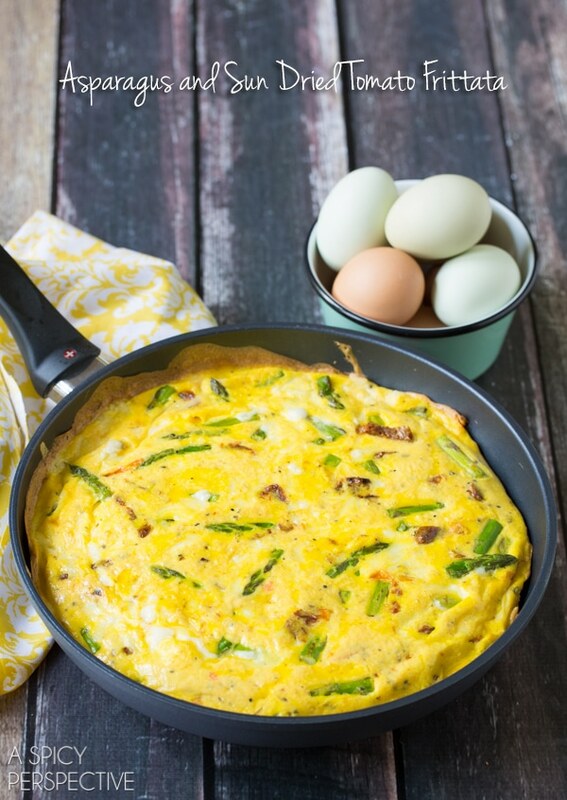 Love everything about this frittata! So beautiful colors. Love you made the frittata with asparagus. Have to admit I never tried a frittata with it. Love asparagus – grean and white. But never thought of greens with sun-dried tomatoes. Thnak you! I agree, this would be wonderful any time it’s served. Our local asparagus is gorgeous right now. Can’t wait to try this, Sommer! Loooove frittata recipes! Looks delish!! I love that I can eat this at any point in the day! Looks awesome! You know, I’ve never made a frittata…or tried fontina cheese!